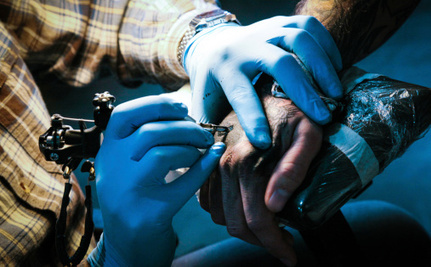 Care2 Causes | Should Firing Someone Over Their Tattoos Be Illegal? Should Firing Someone Over Their Tattoos Be Illegal? To get a tattoo or not. It’s a big decision — and it’s even more daunting when you consider that, at the moment, it’s often perfectly legal in most places to refuse to hire someone or to fire them on grounds of their body art. But should it be? I have to come clean. I like ink. I’m a writer, so maybe that’s not surprising. Specifically, I like tattoos. When they’re done well I think that they can be a glimpse into the inner life of a person. I also should admit to finding them attractive on both sexes. Yet there’s a difference between admiring tattoos and wanting one yourself. I’ve been thinking about getting a tattoo for a while now. I had surgery on my wrist in January of this year and while my surgeon was excellent, a scar was inevitable. It has paled a great deal, but there is a distinctive blemish on my wrist that isn’t easily missed. As such, I thought a tattoo might be a favorable alternative to what is quite an ugly mark. I hesitate not because of the prospect of pain — I have a fairly high threshold for discomfort — and not because I worry I will change my mind. I know exactly what the tattoo would be, and have for quite some time now. My main worry, actually, is what it might mean for my future opportunities, both in terms of employment and volunteering. A tattoo on my wrist would be hard to disguise and I am conscious that several people in my life have faced negative experiences simply because of their (rather innocuous) tattoos. One friend of mine was refused work on a cruise ship because of his visible tattoos (the pattern he has rises about two inches above the shirt collar-line), despite it being strongly hinted that in all other respects he seemed an ideal candidate. Another friend of mine is a teacher and she often talks about her school’s strict dress code, including that her fellow workmates can’t wear sandals in the summer due to having tattoos on their ankles or the top of their foot and must cover up any other visible tattoos by either wearing a pullover or using things like band-aids. As a result, there has been some push to change the law in the UK. Currently, it’s legal to make employment decisions on the basis of someone having tattoos so long as these decisions are consistent and reasonably related to an employer’s concern that tattoos could damage or in some way tarnish the business by association. The only caveat appears to be if the employee can establish that the tattoo is part of their religious expression, though obviously this is difficult to do. Some legal analysts have argued there may be scope under the UK’s Equality Act to make a claim on the basis that the tattoo is a physical feature of a person, but such an argument has not been tested to any legally meaningful degree and most are skeptical of its power. In the United States, where freedom of speech is given particular weight under constitutional law, we might expect there to be more significant barriers to this kind of discrimination. However, by in large that is not the case. A US federal appeals court ruled in 2006 in a case dealing with police officers who had been ordered to cover-up what might have been racially sensitive tattoos, that ordering public employees to not display their tattoos doesn’t create an unreasonable infringement of First Amendment rights. As such, and similar to those in the UK and much of Europe, US law currently allows an employer to fire someone if he or she believes that the tattoos, whether old or new, violate the dress code or risks harming company image, something that employers like Starbucks have used in the past. In essence, legally speaking this isn’t yet classed as discrimination in most places, and so there’s little legal protection. There is, however, some intersection with other protected classes. For instance, people have successfully won claims of discrimination where the tattoo issue has actually disguised some kind of gender, racial or religious bias, all of which are protected under the Civil Rights act. That said, some companies have decided that tattooed employees are not a problem, for instance Whole Foods tends to be tattoo-accepting, as are certain other employers — but usually this comes at the discretion of local and regional managers and isn’t official policy. Rather than going after federal and state level protections, some groups believe that a more fruitful approach would be to apply pressure directly to businesses themselves in order to first clarify their policies and to move toward greater acceptance of people with tattoos and other body modifications by having businesses state an official policy against discriminating against people with non-offensive tattoos –which is a term that would need some adjudicating, but of itself wouldn’t be that problematic. By side-stepping legislation, there wouldn’t be comprehensive or concrete protections, but it may be a much faster route to go down and in the end more useful precisely because it would reflect a public desire rather than being the result of a costly and heavy-handed legislative effort, thereby demonstrating the public shift toward accepting tattoos and how we are now waiting for the employment sectors to catch up. Can we discriminate disabled people? Employers should have the freedom to hire and fire whoever they want. Stores and restaurants have an image they need to uphold to keep their customers coming back. If someone has tattoos before they're hired then it should be unreasonable to fire th because of their tatts. Equally if it is stated clearly in your contract, then do not risk it either. But it should be tightened up so that people with tattoos are not discriminated against. Only if the tattoo in questions isn't obscene. Tattoos were originally used to mark criminals. If one studies it out they will find that Cain's "mark" after he killed his brother was a tattoo. Now days, with the battle for the minds of men raging as it does a mark can be on the mind and only those who are spiritual and know the truth can ever see it. Being a musician all a my life I've interviewed hundreds of guitar players, bass players, drummers, etc., and I don't mind a player having tattoos. But, one a my most important questions to any one of them is, "Do you have any racist or gang related tattoos?" I go to gigs to play music and have a good time, not get into a pow wow over a racist slur or catch a stray bullet from some rival gang member. Therefore, I do not hire people with racist and gang tattoos and I don't feel I should have to. I don't have any. I don't need tattoos to fit into my peer group.